Craig Bell, Tennis Director, is a member of both the PTR and USPTA, and highly involved in both USPTA Texas Division and the Dallas Professional Tennis Assocation. Bent Tree Country Club Tennis Facility recently underwent a complete tear-out and rebuild of four indoor courts and the proshop. Give Craig a ring if you’re considering a big project as he navigated it beautifully and came in under budget (how often does that occur?!). The Green Tennis Machine has been great. Our ball budget has decreased immensely. 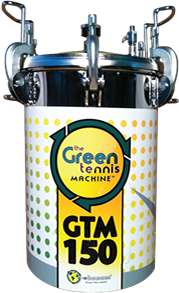 We have been able to utilize the Green Tennis Machine very effectively in the teaching program. It doesn’t take very long to basically cook up the balls and get them back in the system within 3 or 4 days. So, it has been a great help and a great benefit for the overall operation. Does just as well on regular regulation yellow official tennis balls as well as regular quick start, red, green and orange balls as well. We use them for everything basically, and so if they are teaching baskets, they go back to the ball machines just you know all over the place. Anything you can think of where you get tennis balls involved in the program, whether it’s lessons, balls machines whatever you know we use the balls from the machine all the time. I am Craig Bell, I am the Director at Bent Tree Country Club Tennis in Dallas, Texas. I have been here 17 years. Country Club has been here since 1974. We have a private member owned country club located about 5 miles north of the Galleria, in the North Dallas, far North Dallas area of the city. We have a full course country club atmosphere with golf course, fine dining, fitness. And we have 16 courts, 4 of which are indoor and 12 of which are outdoor. Really nice facility as you can tell. We have a lot, as most country clubs around the area are heavily influenced by the ladies programs. We have a lot of ladies programs. Monday through Friday, mostly during the morning times, we have afternoon kid’s classes. We do a few men in the evening, but heavily influence by the ladies. We have a little bit of a weekend program, but we have about 300 players, and probably about 100 kids that participate as well. So, about 400 total players at the country club at this time.